The Reif 2018-2019 season tickets go on sale Monday, August 6 beginning at 8:30 a.m. There are more than 50 scheduled shows with more planned through June, 2019. The list of shows and details available HERE. According to Dow another goal at The Reif is to bring value to the community by keeping prices reasonable through partnerships with local businesses. The Reif offers a variety of discounts from a series discount of 10 percent on each show when ordering three or more shows at a time, a limited number of Super 8 seats for $8 each and student rush tickets for $5 an hour prior to each show. 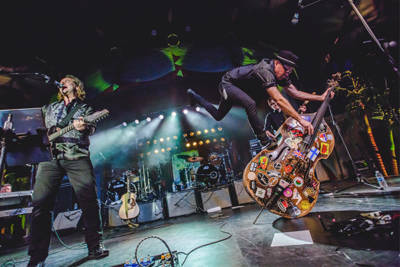 Live theater, music and dance include perennial favorites like Eagles tribute featuring The Fabulous Armadillos and Collective Unconscious, Rock and Roll Christmas, and Reif Nutcracker, plus new shows like Broadway’s Rock of Ages and Diamond Rio. Showcasing Minnesota musicians through a partnership with KAXE CenterStage Minn. brings up-and-coming talented Indie artists to the Ives theater the third Thursday of each month Sept-May. The Reif had many sold-out shows last season and they expect the same this season. Thanks to our sponsors: 1st Nat’l Bank of Coleraine, Abstract Service Co., American Bank, AmericInn, Anderson Family Dental, AOS Law, Arrow Embroidery, Blandin Foundation, Center for Diagnostic Imaging, Computer Enterprises, Country Inn and Suites, Creative North Graphic Design, Deerwood Bank Edward Jones: Kristina Gaalaas; Edwards LaPlant Construction, Essentia Health, Forest Lake Restaurant, Grand Dental Center, Grand Itasca Clinic and Hospital, Grand Organic Foods, Grand Rapids State Bank, Grand Rapids Vet Clinic, Green Heron Bed and Breakfast, Hawkinson Construction, Itasca Community College, Itasca Reliable Insurance, Itasca Surgical, James F. Johnson DDS /Jeffrey N Bolz DDS, Jess DDS, Jimmy Johns, Kevin & Cindy McNichols, Lake States Tree & Construction, Lake& Co., Minnesota Public Radio, Miskovich Dental, Northview Bank, Oak Hills Assisted Living, Paul Bunyan Communicaiton, Personnel Dynamics, Range Water, Reif Arts Council Board, Schroeder Log Homes, Sholom Blake CPA, Super 8 Motel, Super One Foods, Swanson Law, Timberlake Lodge, Travel Leaders, Walmart, Woodland Bank. Meida Sponsors: Northern Community Radio KAXE and KBXE; Lamke Broadcasting KOZY, KMFY and KBAJ and Grand Rapids Herald Review. Many of these activities are made possible by the voters of Minnesota through a grant from the Minnesota State Arts Board and Arts Midwest, thanks to a legislative appropriation from the arts and cultural heritage fund.